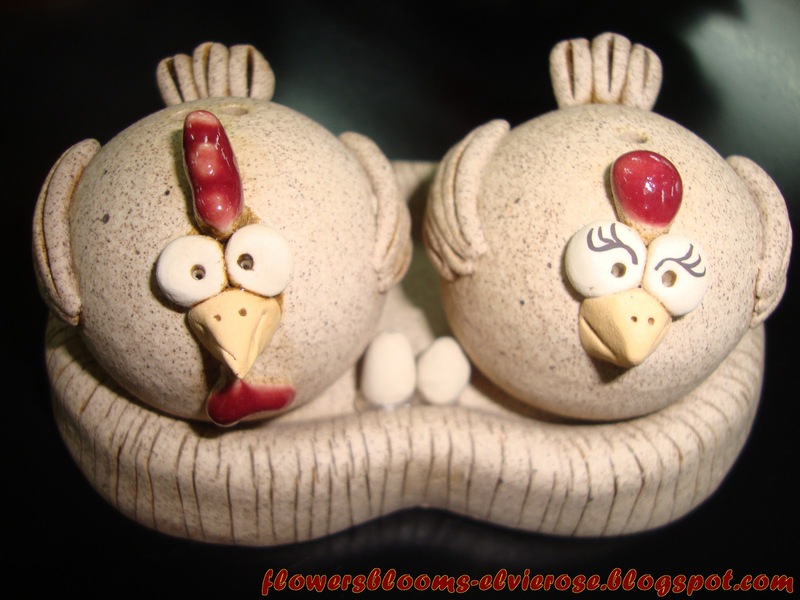 FLOWERSBLOOMS by "Elvie": Take a look at these Cute Little Chickens ! 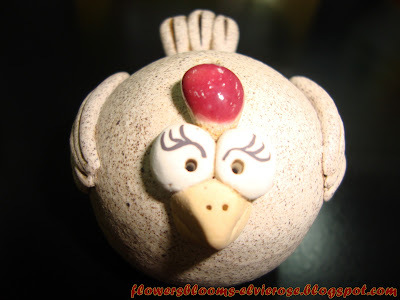 Take a look at these Cute Little Chickens ! A pair of Cute Little Chickens ! Look at what I got from one of my friend in Malaysia, Ms. Usha Thangaraja...Cute Little Chickens ~ A Rooster and a Hen ! This item was sent over through my co-worker at SunPower who is currently assigned at our Fab 3 in Malaysia and who went back to the Philippines for awhile to spend Christmas with his family. Do you know what they are ? These are actually salt and pepper shakers. There are holes on top of the chickens. Salt and pepper shakers are condiment holders used in Western culture that are designed to allow diners to distribute edible salt and ground peppercorns. 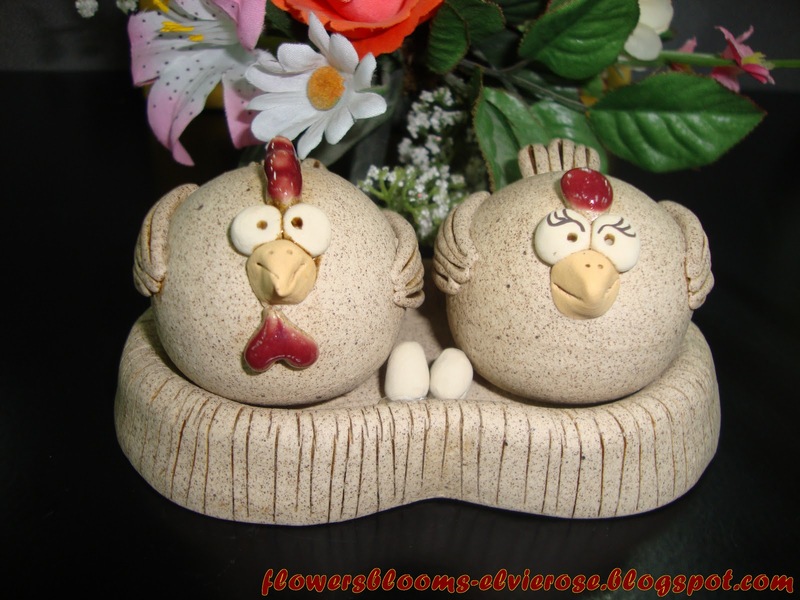 Salt and pepper shakers can be made from a variety of substances, including plastic, glass, metal, and ceramic. Except in the most casual dining establishments, they are usually provided as a matched set, sometimes distinguishable only by the number of holes on the top of the shaker. Designs range from small, plain glass screw-top containers to more ornate works of art. Sometimes the design refers to some pair of related objects like these chickens ~ The Rooster and the Hen. 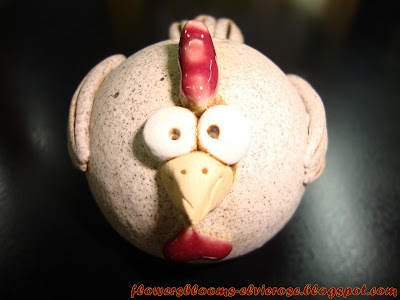 Designs may also relate to specific occasions such as holidays. Because of diversity of design, collecting salt and pepper shakers is a hobby. Design of salt and pepper shakers has also been used to transmit cultural perspectives about race, friendships, and other cultural values. A Coach from the Heart of MT !!! A Get Well Plant and Get Well Wishes ! Welcoming the New Year 2011 ! A Fresh New Look !